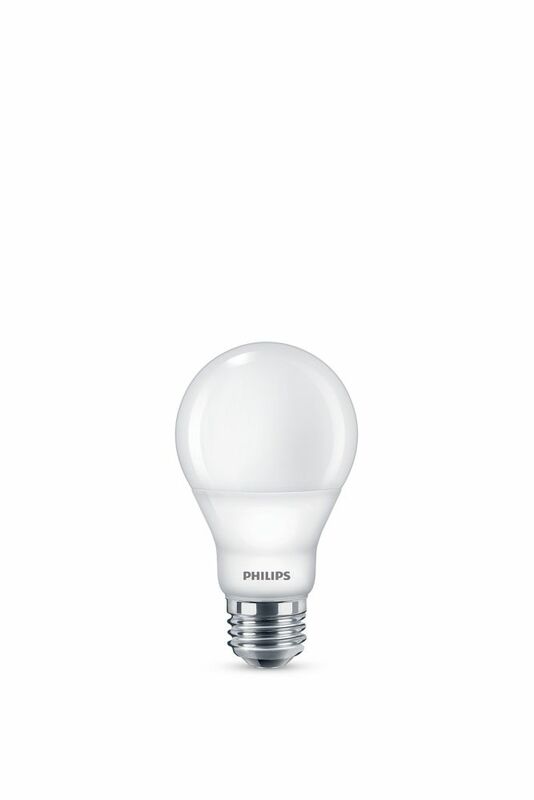 Philips LED 60W equivalent A19 Household bulb with dimmable warm glow light (2700K - 2200K). As light is dimmed, the colour temperature transitions from 2700K to 2200K creating a warm glow replicating incandescent lighting. Fully dimmable and with a medium base. In use this bulb gives the appearance of light all-around (360 degrees). This bulb replaces your current 60W incandescent A19. This energy saving 9.5W bulb uses $26.13 of electricity over its 15,000 hour life, a $138.87 savings when compared to the $165.00 required to run a 60W, 800-lumen A19 bulb over the same period. Perfect for table lamps, floor lamps and wall sconces. ENERGY STAR certified. Innovative LED dimmable light with a warm glow. An alternative to incandescent bulbs. Transitions from 2700K to 2200K with dimming. Fits easily into existing fixtures. Ideal for table lamps, floor lamps and wall sconces. Questions or comments - please call 1-800-555-0050. Philips LED SceneSwitch 100W equivalent bulb. One bulb, three colour settings all with the flip of the existing light switch. No installation required. Dimmed light without the hassle of a dimmer. Select the light setting from a functional light, to a natural energizing light, to a cozy warm glow. Colour temperature range: Soft white (2700K), Daylight (5000K), and a dimmed warm glow (2200K). Memory features remembers the last setting of the bulb - no need to cycle through. Energy saving. Long life. Instant-On - delivering beautiful, consistent light. A21 shape - similar size and shape as traditional 100W bulb. Ideal for table and floor lamps. Medium base (E26). Philips LED 60W equivalent A19 Blue - festive light bulb with medium base is perfect for parties, holiday and special occasions. Energy savings and long life. Instant-on - delivering beautiful, consistent light. A19 shape - similar size and shape as a traditional incandescent bulb. The A-Shape party bulb combines the popular A19 shape with all the benefits of LED technology. Philips LED 60W equivalent A19 Red - festive light bulb with medium base is perfect for parties, holiday and special occasions. Energy savings and long life. Instant-on - delivering beautiful, consistent light. A19 shape - similar size and shape as a traditional incandescent bulb. The A-Shape party bulb combines the popular A19 shape with all the benefits of LED technology. LED 9.5W = 60W A-Line (A19) Warm Glow (2700K- 2200K) - ENERGY STAR® Philips LED 60W equivalent A19 Household bulb with dimmable warm glow light (2700K - 2200K). As light is dimmed, the colour temperature transitions from 2700K to 2200K creating a warm glow replicating incandescent lighting. Fully dimmable and with a medium base. In use this bulb gives the appearance of light all-around (360 degrees). This bulb replaces your current 60W incandescent A19. This energy saving 9.5W bulb uses $26.13 of electricity over its 15,000 hour life, a $138.87 savings when compared to the $165.00 required to run a 60W, 800-lumen A19 bulb over the same period. Perfect for table lamps, floor lamps and wall sconces. ENERGY STAR certified. LED 9.5W = 60W A-Line (A19) Warm Glow (2700K- 2200K) - ENERGY STAR® is rated 4.8 out of 5 by 4. Rated 5 out of 5 by MLOUR from Warm like an Incandescent Just replaced my 100W with these dimmable LED's and very pleased. Will do the other lamps now. They do not dim down to OFF but not a problem for me. If I change my Leviton Universal to a Lutron Universal I think the dimming will go lower but for me it is AOK. Rated 4 out of 5 by Raybie from Perfect Light Love that these are warm glow and don't make our bathrooms look like a hospital room. Surprised to learn that they were $3.00 less per bulb a year after I bought 15. Had one stop working and Phillips sent me a check for the full price that I paid. So at least I got a discount on the replacement. Surprised I had one out of 15 go bad. Rated 5 out of 5 by johnes from Great product. Looks fantastic. I have tried lots of different CFLs and LEDs over the years. I often have to take them back or listen to complaints about how they look as my wife is very particular. I tested these out on a fan where I replaced 2 bulbs and left 2 incandescent bulbs in it. She actually liked the LEDs better. Another benefit is that these ones really dim. A lot of LEDs sort of dim but these ones do a great job, especially if your dimmer has the little +/- adjustment on it.